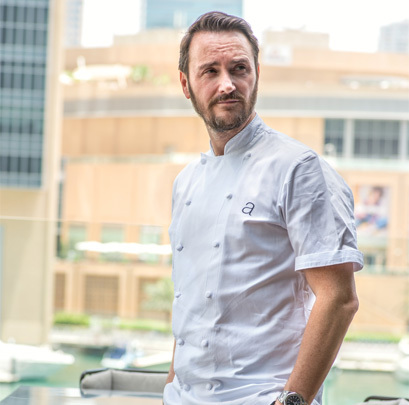 He’s the creative brain and founder behind Dubai’s latest restaurant hit, Marina Social in InterContinental Dubai Marina, and the man who has successfully opened 14 restaurants around the world in just five years – he’s a pretty busy guy, to say the least. Within the first year of opening, his restaurant Pollen Street Social in London earned a Michelin Star, while his other restaurants have gained recognition in some of the world’s biggest food-thriving destinations including Hong Kong, Sydney and New York. Having trained under and worked alongside chefs like Gordon Ramsey, Pierre Koffmann, Marco Pierre White, Nico Ladenis and Ferran Adria at el Bulli, it comes as no surprise that he’s created such success in the restaurant scene. Despite his busy schedule, Jason found time to catch up with us during his trip to Dubai last month. Here’s what he had to say…. Taking it back to the start. What’s your first prominent food memory? When I was young, my parents had a guest house in Skegness, Lincolnshire, catering to for 20-30 people. It was only small and had a little bar and tiny restaurant for the in-house guests. My mum was always cooking; whether it be sticky toffee pudding, roast lunch on a Sunday, prawn cocktails, or fish dinners for fish Friday. It was very simple cookery, but everything was done fresh and as good as it could be from mum’s side with no kitchen team. We used to help out with the washing, shredding a bit of iceberg lettuce, mixing the cake batter and stuff. I grew up around food and loved it. So when did the passion shine through? As you get older you start to understand that food is an integral part of family life and it became a passion. I’ve always been around hospitality and felt comfortable in that environment. From about the age of 13 years old onwards, I wanted to become a chef, because I just really loved cooking. And… I was really bad at football anyway, so that dream went out the window (laughs). What do you like most about your job? At this stage in my career, the creative process is so much more interesting and enjoyable. It encompasses more than it does when you first start out. It’s now everything from creating a concept, to tableware, to uniforms, to food, to décor and more – the creative process goes beyond so much more than food now. It’s very fulfilling to create a concept from start to finish and see it come alive and people enjoying it. You create somewhere for people to make memories and that’s really nice. How often does your menu change at Marina Social to reflect seasonality? It happens regularly, and what we try and do is analyse what people like. The social dog for example is our best seller, and we’d be crazy to take it off the menu. We try and keep things people enjoy, while improving them at the same time. We try and stick to the British seasons, so when asparagus or strawberries are in season, we’ll put it on the menu, when sea bass is good in the UK, we try and put it on, and so forth, it gives us direction. Is your menu here child-friendly? Yep! We have pizza, fish and chips – all those things kids love. But we try and make it a little bit healthier for them. Like what me and my wife, Irha do at home with our children. If the kids want pizza, we’ll take them somewhere that makes homemade pizzas with fresh, in-season produce. Or we’ll have fish and chips, but made with fresh Dover sole, done nicely with homemade chips. It’s important to teach children about good food. Many parents complain about children being fussy eaters, what would your advice to them be? Everyone says that their kids are fussy eaters, but that’s down to the parents. I sound like a bit of a winge bag here, but at the end of the day, children are a product of their environment. That’s a fact. If you allow your child to misbehave in a restaurant, run wild and knock things over, they do that because you allow them to. They do that because you’re not teaching them behavior patterns of what they should and shouldn’t do in restaurants. It’s important to teach children manners and respect, and with that respect and understanding for good, quality food. In the kitchen with you at home, what five ingredients will always be found? Good olive oil, Cornish sea salt, good vegetables that I have delivered fresh every Monday, good butter, and I always have two fresh fish deliveries twice a week to the house. With all of your travelling, what’s the most recent trend you’ve seen in the culinary world that’s caught your attention? Something I see that is a trend all over the world, which will slowly creep into Dubai, is that you no longer have to be deemed as a world-renowned chef, with three Michelin stars to earn yourself a name in this industry. I’ve just come back from Australia’s Top 100 Restaurant Awards, where some of the chefs getting the most awards were from unrecognised restaurants like Ester and Automata – all these places that have got a couple of chefs in the kitchen, doing their thing and making it work. The chef industry has nicknamed it ‘dude food’, which is a little more casual and allows food sharing to be recognised. Never in a million years would that have been considered as good food a few years ago – it was seen as pub food, but it’s the way the world is moving – away from tasting menus and things like that. There will always be a place for fine dining, but it’s becoming wanted less by the customer. What’s the biggest misconception that people have about professional chefs? I think people think that chefs are angry and unapproachable, but that’s not that case. It might have been 20 years ago, but it’s not now. Chefs are usually overly generous if anything. For our home cooks, what’s the best skill they can have? When you’re cooking at home the absolute essential ingredient to have is to understand your capabilities. So many home cooks when they have a dinner party get overly complicated with difficult recipes that they think will impress their guests, only for it to turn into a disaster. Always do one course you’re comfortable with, and one that can be made ahead so it allows you time to socialise. Keep things simple, basic and fresh. Enjoy food, and don’t make it stressful. What’s the one kitchen implement you couldn’t do without? Apart form the obvious being my knife. I’d say my Kitchen Aid blender. I do everything in it, from making my kids smoothies in the morning, to pesto, sauces and soups. It’s the new one that locks in and heats food too. It’s fabulous!